Senior Quality Analyst’s work is needed in software development and manufacturing companies, the work settings of these analysts are to provide quality products, be it software or product and service. The senior level quality analysts are involved in testing and improving them before it is handed over to the customers. The senior quality analyst shoulders some core job duties such as checking the products and systems for any defects and ensuring that it abides by the industry standards, reading blueprints, employing inspection elements, returning defective products, making improvement suggestions and changing QA techniques based on business and customer needs. 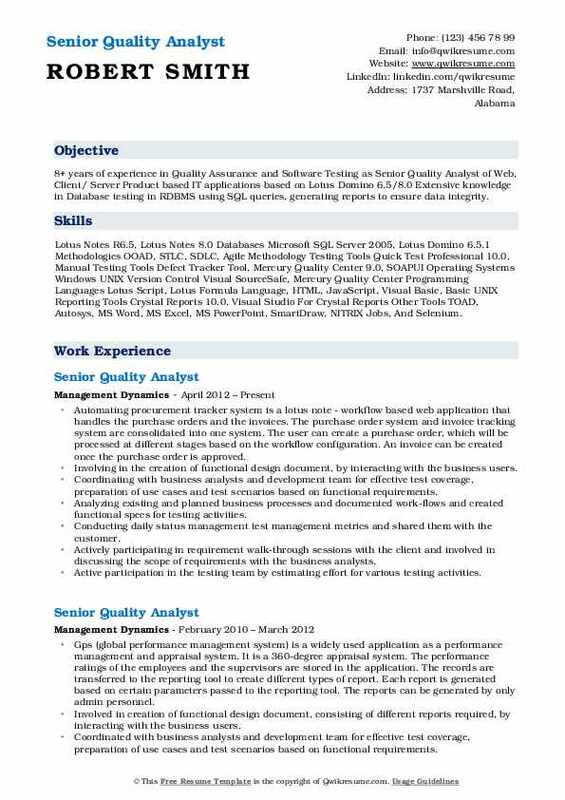 A well-written Senior Quality Analyst Resume mentions qualifications such as proficiency in HTML, Weblogic, Apache, SOAP, API, and Oracle. 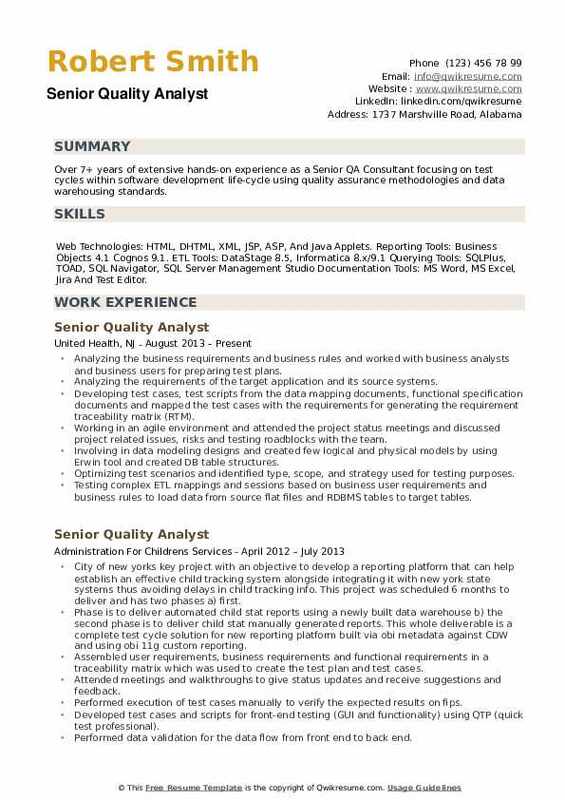 Strong knowledge of software quality procedures and software development cycles would highlight the resume. Successful candidates portray a Bachelor’s degree in Computer science or manufacturing engineering field. Summary : Senior QA Analyst with 15+ years of extensive experience in testing highly available, large-scale client-server based web application, with exposure to all the phases and various methodologies of SDLC. Skills : Management Tools JIRA, Rational Clear Quest, Quality Center Test Automated Tool Quick Test Pro (QTP), QA Wizard, Win Runner Database and Tools SQL Server 2005 and 2008, Oracle 10g, TOAD Scripting Visual Basic, SHELL, HTML, XML Web services Testing Tools SoapUI, And Altova XML Spy. Participating in daily scrum meetings, use case review meetings, test case review, sprint planning session, walkthroughs, retrospective meetings and QA signoffs. Responsible for designing test plans and high-level test scenarios, defining test cases, developing and maintaining test scripts based on user stories. Conducting tests and analyze results to ensure that software meets or exceeds specified standards and/or client requirements. Performing system testing, system integration testing, browser testing, usability testing and database testing. Performing mainframe testing to ensure front-end functionally has saved/updated data on the backend mainframe system. Tracking and incorporating frequently changing requirements in the test scenario and test cases documents. Preparing test data by setting up test accounts for various environments to perform specific test scenarios. Executing automated test scripts for regression testing using the QTP tool. Performing web services testing using soap UI for modules like foreign exchange, locate ATMs. Using Jira to create, assign and track defects and to create weekly defect status reports. Headline : Over 6 years of experience in Quality Assurance and Software Testing. Writing and executing test plans and test cases in highly structured/ nonstructured environments and performing all types of testing. Analyzing the business requirements and understanding the high level and detail design of the application. Writing test plans and test cases that identify the schedules, environments, resources (personnel, tools, etc. ), methodologies, cases (inputs, procedures, outputs, and expected results), documentation, and reporting criteria. Defining testing entrance and exit criteria; ensured business and technology acceptance. Responsible for creation and maintenance of test matrix and traceability matrix. Executing manual and automated test cases and verified results with expected results. Involving extensively in conducting integration, performance, and UAT testing. Using selenium web driver with Java to generate automated test scripts for functional testing, GUI testing and enhancing the existing scripts. Performing data have driven testing to validate the components displayed on the website using selenium. Performing regression testing for every modification made in the application and new builds using selenium web driver. Involving in functionality, user interface, and regression testing during the various phases of development using selenium/testing. Involving in executing selenium test scripts on different types of browsers and checked for compatibility. Automating the test cases using Gherkin, cucumber behavior is driven development (BDD), and selenium web driver and Java. 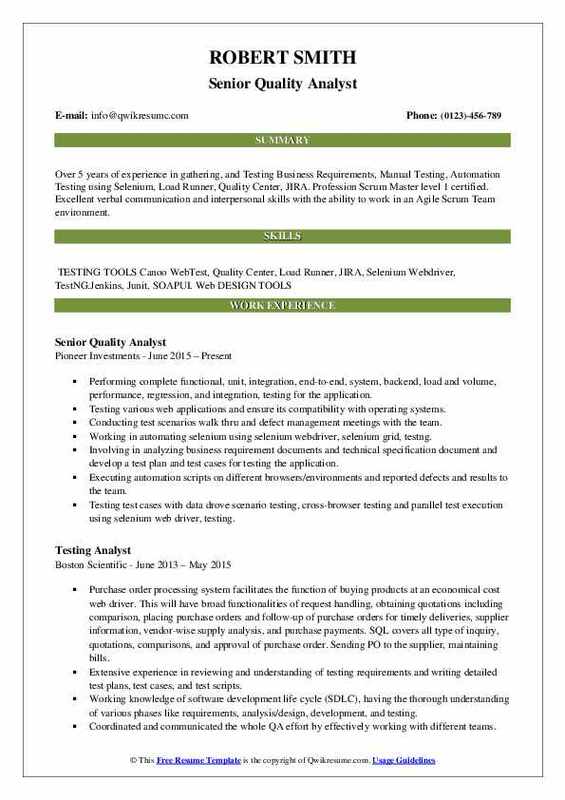 Headline : Over 5 years of experience in gathering, and Testing Business Requirements, Manual Testing, Automation Testing using Selenium, Load Runner, Quality Center, JIRA. Profession Scrum Master level 1 certified. Excellent verbal communication and interpersonal skills with the ability to work in an Agile Scrum Team environment. Performing complete functional, unit, integration, end-to-end, system, backend, load and volume, performance, regression, and integration, testing for the application. Testing various web applications and ensure its compatibility with operating systems. Conducting test scenarios walk thru and defect management meetings with the team. Working in automating selenium using selenium webdriver, selenium grid, testng. Involving in analyzing business requirement documents and technical specification document and develop a test plan and test cases for testing the application. Executing automation scripts on different browsers/environments and reported defects and results to the team. Testing test cases with data drove scenario testing, cross-browser testing and parallel test execution using selenium web driver, testing. Creating an automation framework in selenium web driver using behavior driven approach like behave, cucumber. Extensively used page objects design and page navigation framework for readable test script and easy maintenance from developer perspectives. Integrating automation scripts (selenium web driver API) in continuous integration tools (Jenkins) for a nightly batch run of the script. Checking the data flow through the front end to a backend and used SQL queries, to extract the data from the database. Extensively automated regression and functional suites by using selenium web driver. Summary : 18+ years of experience as a Sr. Quality Analyst in the Information Technology with emphasis on Software Quality Control, Test Automation at Deloitte Consulting, India. Worked rigorously in Agile and Scrum methodologies. Hands-on experience in programming languages such as C, C++, Java. Excellent in verbal and oral communication, presentation and interpersonal skills. Skills : Microsoft Excel, Microsoft PowerPoint, Microsoft Visio, SAS, SPSS, Meditech, Midas Plus, Midas Plus, Microsoft Project, And SQL. Working with operations management team to ensure proper procedures are being followed. Conducting client meetings to discuss calls that agents take on behalf of that specific client. Facilitating a defined range of targeted skilled building programs/courses supporting the development of employees. Providing subject matter expertise during the design/development phases of learning programs. Conducting entry level complex training sessions for new or cross-trained employees. Ensuring all training materials were up to date with changes that may have occurred. Helping in the completion of transitioning of the call center moving from Dallas, TX to Louisville, KY.
Providing coaching opportunities to call center representatives as needed. Initiating reports to management on a weekly and monthly basis of the quality scores for each call center representative. Performing merchant maintenance functions for entire merchant databases. 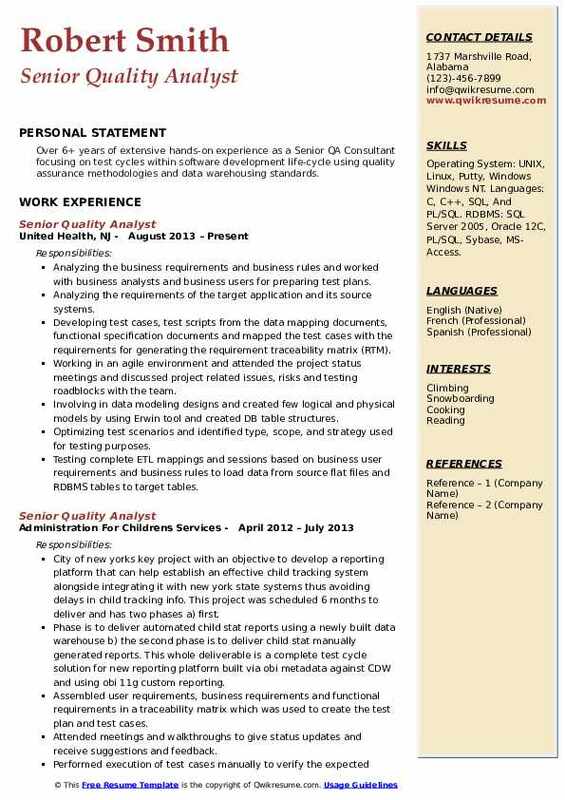 Headline : Resourceful and dynamic technical professional with nearly 5 Years as a Sr. Quality Analyst, in software quality testing expertise, coupled with knowledge of programming languages and maintenance experience in Healthcare and Finance Industry. Skills : C# And Core JAVA Operating Systems: Windows Server 2003, Red Hat Linux, Databases: SQL Server 2008, Oracle Software Development Methodologies: Agile, Waterfall, Modified Waterfall Job Scheduler - Tidal, Jenkins API Testing- Rest Client, Postman, And Selenium Framework: TestNg. Designed and development of test cases based on functional requirements for institutional and professional claims for EDI an HIPAA transactions 837/835 and 834 testing using the project management tool Jira. Test automation - automation smoke and regression test cases using selenium web driver which includes framework development and script creation using testing. Conducted training sessions on selenium web driver and framework development. Checked the amount of coverage a customer should receive for facility claim according to the procedure done and the coverage on the account in UAT. Created object repositories and architecture of automation framework such as data-driven, hybrid and business process testing (BPT) for automation testing. Created function libraries and used descriptive programming in qtp to enhance the script readability and usability. Worked in agile scrum development environment with frequently changing requirements and features set. Interacted with business analyst, developers and team members in requirements, analysis, design reviews, testing and documentation for application developed in an agile environment. Participated in a scrum meeting, sprint retrospective meetings, sprint review meetings. Validated the functionalities, fields, links, images and reports as per the requirements against the applications. Responsible for exploratory smoke testing, regression testing, database testing, functional testing and user interface testing of cash office application in the linux environment. Participated in the daily center along with business analysts and developers. 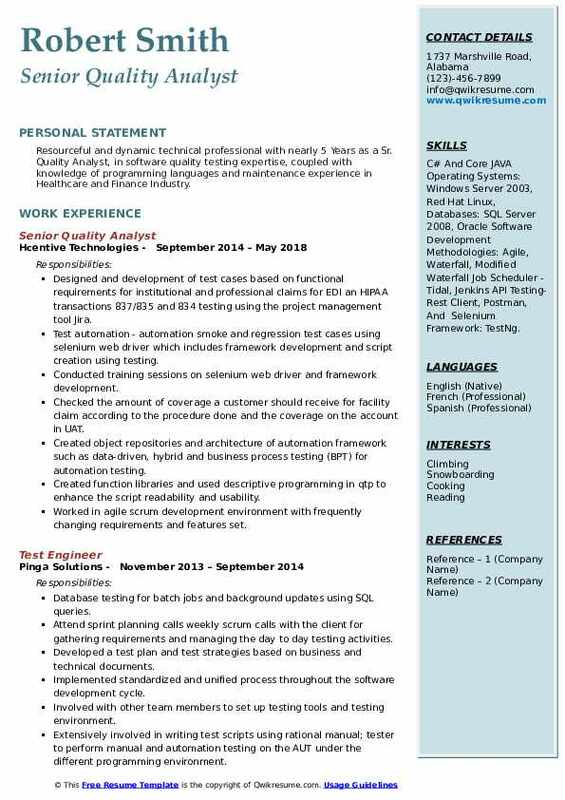 Summary : 8+ years of experience in Quality Assurance and Software Testing as Senior Quality Analyst of Web, Client/ Server Product based IT applications based on Lotus Domino 6.5/8.0 Extensive knowledge in Database testing in RDBMS using SQL queries, generating reports to ensure data integrity. Automating procurement tracker system is a lotus note - workflow based web application that handles the purchase orders and the invoices. The purchase order system and invoice tracking system are consolidated into one system. The user can create a purchase order, which will be processed at different stages based on the workflow configuration. An invoice can be created once the purchase order is approved. Involving in the creation of functional design document, by interacting with the business users. Coordinating with business analysts and development team for effective test coverage, preparation of use cases and test scenarios based on functional requirements. Analyzing existing and planned business processes and documented work-flows and created functional specs for testing activities. Conducting daily status management test management metrics and shared them with the customer. Actively participating in requirement walk-through sessions with the client and involved in discussing the scope of requirements with the business analysts. Active participation in the testing team by estimating effort for various testing activities. Actively participating in identifying and developing test scenarios, test cases, documenting and reviewing them on a product to product basis based on requirements document. Performing core-level testing to ensure data consistency by writing and executing SQL queries and statements in ms-SQL 2005. Performing functional, configuration, user acceptance, GUI, usability, front-end testing manually. Creating and performing batch testing as per required cycles- configured automated tests, distributed tests to different machines, processed results from test runs using Autosys and NITRIX jobs. Performing manual testing of products in system testing and integration testing environments. 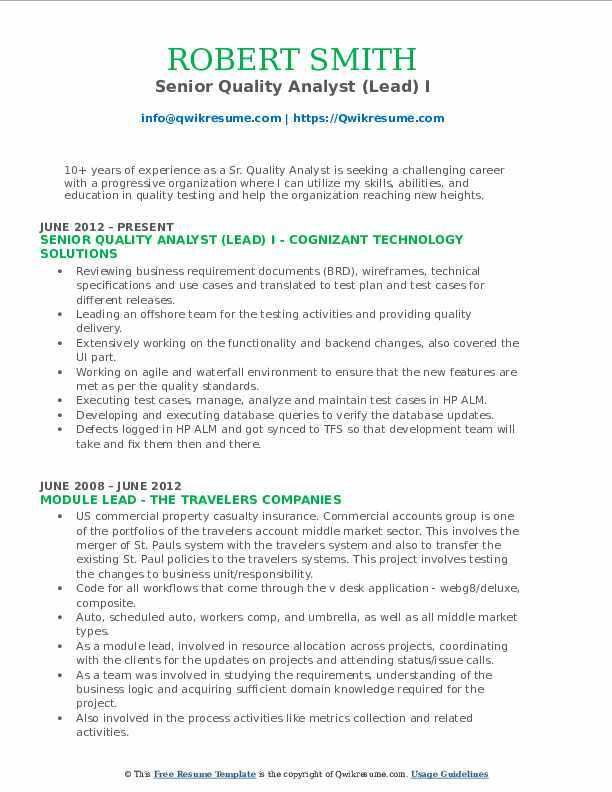 Summary : 10+ years of experience as a Sr. Quality Analyst is seeking a challenging career with a progressive organization where I can utilize my skills, abilities, and education in quality testing and help the organization reaching new heights. Skills : Agile, Mobile, Manual Testing, SQL, ALM, TFS, Bluezone, Quality Analyst, ETL, Functional, Regression, And System Testing. Reviewing business requirement documents (BRD), wireframes, technical specifications and use cases and translated to test plan and test cases for different releases. Leading an offshore team for the testing activities and providing quality delivery. Extensively working on the functionality and backend changes, also covered the UI part. Working on agile and waterfall environment to ensure that the new features are met as per the quality standards. Executing test cases, manage, analyze and maintain test cases in HP ALM. Developing and executing database queries to verify the database updates. Defects logged in HP ALM and got synced to TFS so that development team will take and fix them then and there. Identifying the root cause of the bugs and reported so that issues are not reoccurring. 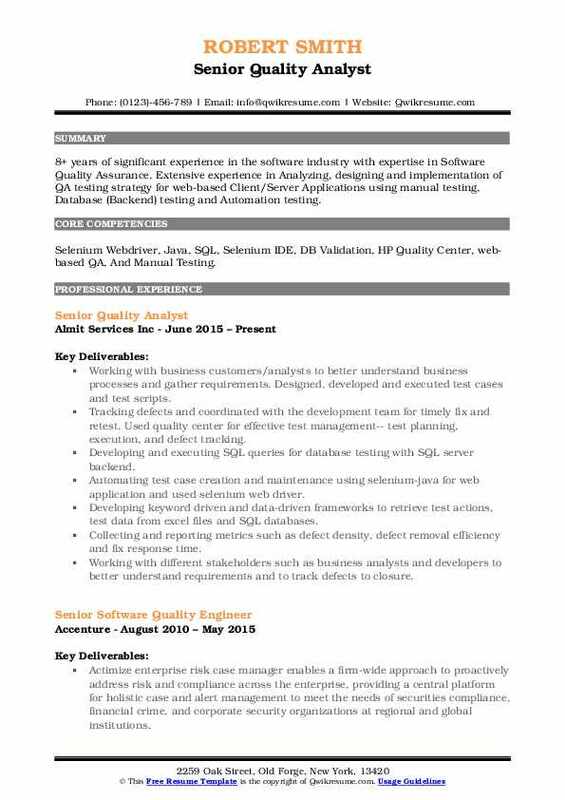 Summary : 8+ years of significant experience in the software industry with expertise in Software Quality Assurance. Extensive experience in Analyzing, designing and implementation of QA testing strategy for web-based Client/Server Applications using manual testing, Database (Backend) testing and Automation testing. 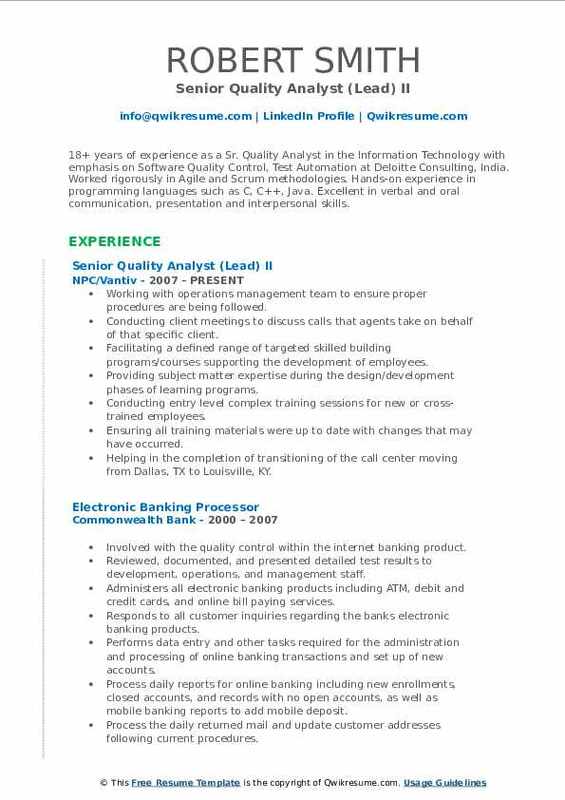 Skills : Selenium Webdriver, Java, SQL, Selenium IDE, DB Validation, HP Quality Center, web-based QA, And Manual Testing. Working with business customers/analysts to better understand business processes and gather requirements. Designed, developed and executed test cases and test scripts. Tracking defects and coordinated with the development team for timely fix and retest. Used quality center for effective test management-- test planning, execution, and defect tracking. Developing and executing SQL queries for database testing with SQL server backend. Automating test case creation and maintenance using selenium-java for web application and used selenium web driver. Developing keyword driven and data-driven frameworks to retrieve test actions, test data from excel files and SQL databases. Collecting and reporting metrics such as defect density, defect removal efficiency and fix response time. Working with different stakeholders such as business analysts and developers to better understand requirements and to track defects to closure. Preparing and using RTM to ensure testing coverage for all functionalities/changes. Provided status and metrics reporting. Participating in full SDLC cycle from inception to deployment with regards to testing (requirement analysis, test planning, test cases, script development, test execution, test reporting, test result analysis and defect retesting). Attending JAD sessions with the business analyst, development team manager, and SMEs. Working closely with the end user, business analyst and the technical team to ensure best practices in testing methodologies. Developing and modifying the testing related documents including test plan, test scenarios, test cases and relevant scripts throughout the project. 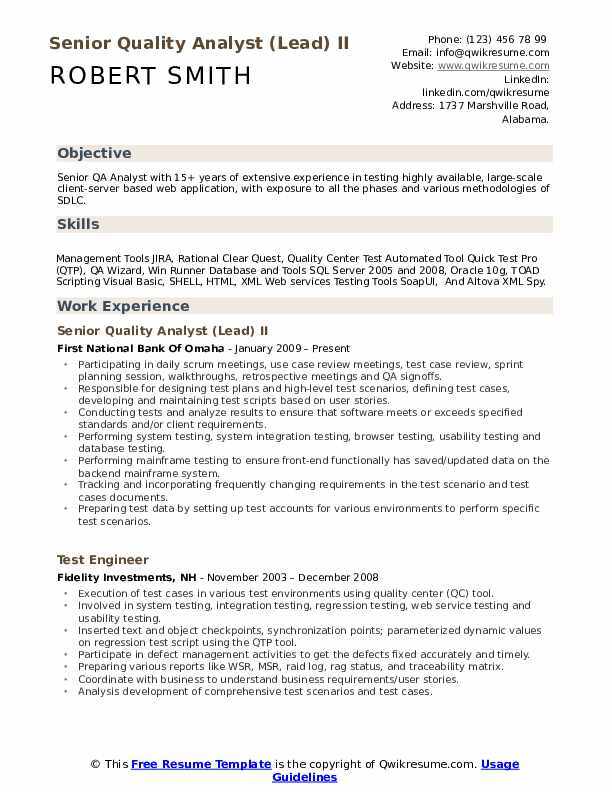 Headline : Over 6+ years of extensive hands-on experience as a Senior QA Consultant focusing on test cycles within software development life-cycle using quality assurance methodologies and data warehousing standards. Skills : Operating System: UNIX, Linux, Putty, Windows Windows NT. Languages: C, C++, SQL, And PL/SQL. RDBMS: SQL Server 2005, Oracle 12C, PL/SQL, Sybase, MS-Access. Analyzing the business requirements and business rules and worked with business analysts and business users for preparing test plans. Analyzing the requirements of the target application and its source systems. Developing test cases, test scripts from the data mapping documents, functional specification documents and mapped the test cases with the requirements for generating the requirement traceability matrix (RTM). Working in an agile environment and attended the project status meetings and discussed project related issues, risks and testing roadblocks with the team. Involving in data modeling designs and created few logical and physical models by using Erwin tool and created DB table structures. Optimizing test scenarios and identified type, scope, and strategy used for testing purposes. Testing complete ETL mappings and sessions based on business user requirements and business rules to load data from source flat files and RDBMS tables to target tables. Creating data-driven test scripts using verification points and synchronization points along with appropriate test data, parameters, and data structures. Developing testing programs that address areas such as database impacts, software scenarios, regression testing, negative testing, error or bug retests, or usability. Developing advanced SQL queries to extract, manipulate, and/or calculate information to fulfill data and reporting requirements including identifying the tables and columns from which data is extracted. 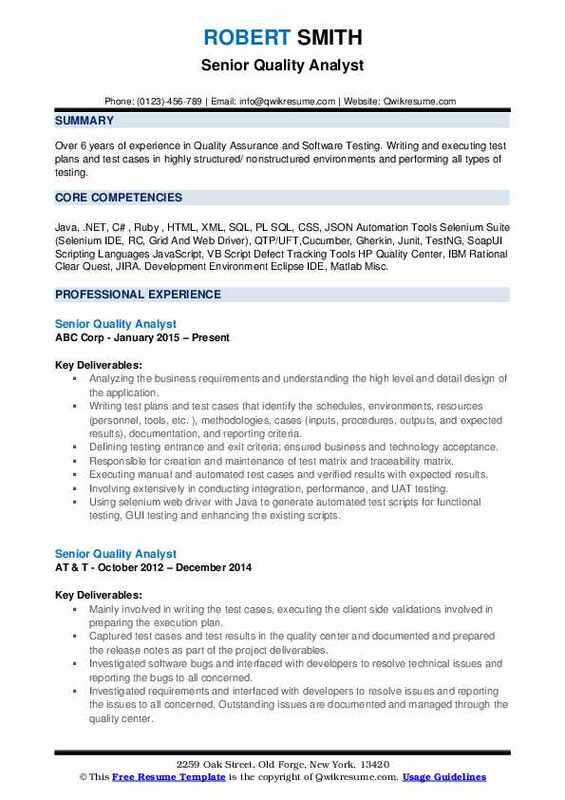 Summary : Over 7+ years of extensive hands-on experience as a Senior QA Consultant focusing on test cycles within software development life-cycle using quality assurance methodologies and data warehousing standards. Skills : Web Technologies: HTML, DHTML, XML, JSP, ASP, And Java Applets. Reporting Tools: Business Objects 4.1 Cognos 9.1. ETL Tools: DataStage 8.5, Informatica 8.x/9.1 Querying Tools: SQLPlus, TOAD, SQL Navigator, SQL Server Management Studio Documentation Tools: MS Word, MS Excel, Jira And Test Editor. Testing complex ETL mappings and sessions based on business user requirements and business rules to load data from source flat files and RDBMS tables to target tables.